“Shy”, “anti-social”, “bookworm”… you can tag them whatever you feel like but introverts (type B personalities) love the way they are and they own it! Yes, the typical Daria or Charlie you know may have come across as a socially awkward person who can only end up dating some imaginary fantastical characters. But, IRL introverts can make an amazing partner and following are the perks of dating one. Type B personalities may not be posting in bold fonts “my bae”, “love” and anything mushy-mushy on social media but, that doesn’t mean they don’t admire their partners. Rather, it’s those small little gestures- that makes their partner so special in their life. Introverts hardly get caught up in heat of the moment situations. They would, in fact, analyze the situation and act all rational about it. You won’t find a Type B personality saying it’s over for every lil thing. In fact, more than anything they love to give space to their partners so that they themselves can enjoy a good “me time”. If you have a girl’s night out or just want to hang out with our friends, your introvert partner won’t create a fuss about being left out. Introverts enjoy being the quiet ones. They can listen to you for hours and hours without getting tired or bored of it. While others listen waiting for their turn, Introvert listen to actually ‘listen’. They are natural empaths, who can feel what you say, cause when they listen, they do it with their hearts. You will always find an introvert partner thinking about why he or she should have done this or that. They are always reflecting upon their thoughts and actions which take them on a self- improvement journey. And when it comes to relationships, they get better like wine. This is because to them quality triumphs quantity. They are selective with people and treasure those who are around. It’s only obvious if you are a loyal partner, you’re in for a lifetime commitment from them. Gossiping, bitching, spreading rumors whatever you may call it, introverts anyway hate small conversations, forget about actually sitting and complaining about others. 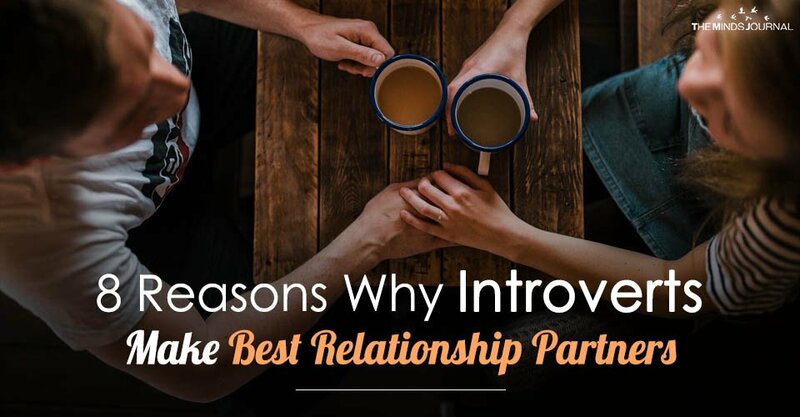 If you adore such quality in a partner, then this is definitely a perk of dating an introvert. The type B’s are usually not the nagging type. Introverts enjoy personal space. This means you don’t have to put up with constant text messages or phone calls every few hours verifying your whereabouts. A drama free relationship is what we all want!